NSCL Notification is out. 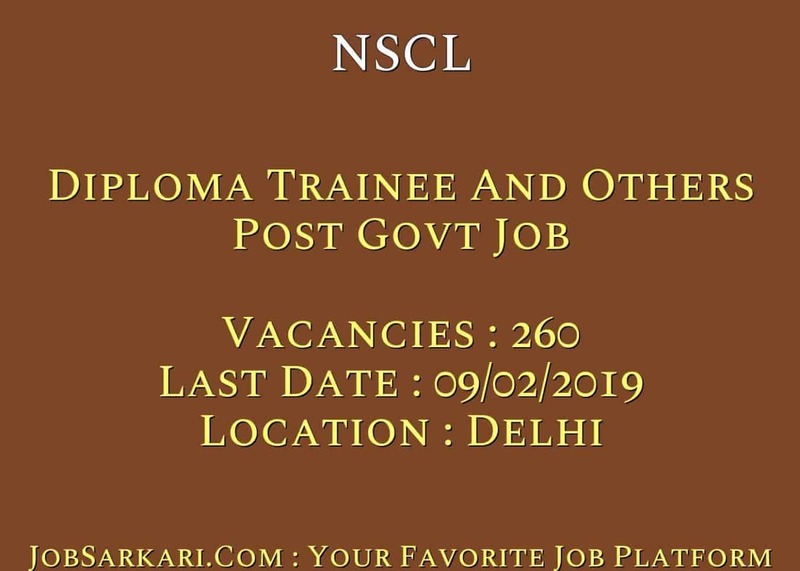 NSCL is recruiting for 260 Diploma Trainee And Others Post Govt Job Posts. You can check NSCL - National Seeds Corporation Limited last date, download NSCL notification, visit NSCL official website and check other NSCL Vacancy details.Complete Vacancy and recruitment Details about 260 Diploma Trainee And Others Post Govt Job vacancies in NSCL are provided below by JobSarkari.Com only for you. Last Date of Receipt Application Form. 09/02/2019. Deputy General Manager (Vigilance). Candidate Must Have Passed MBA And Having 2 Years PG Degree/ Diploma in Related Field/ Having LLB With 60% Marks With 10 Years Experience in Related Field. Max 50 Years. 01. Assistant (Legal). Candidate Must Have Passed Degree in Law With 1 Year Experience in Related Field Max 30 Years. 04. Management Trainee (Production). Candidate Must Have Passed BSc in Agriculture With MBA in Agriculture Business Management or M.Sc Agriculture With Specialization in Agronomy/ Seed Technology/ Plant Bleeding And Genetics With 60% Marks. Max 27 Years. 05. Management Trainee (Marketing). Candidate Must Have Passed BSc in Agriculture With MBA in Agriculture Business Management or 2 Years PG Degree/ Diploma in Marketing/Agri. Business Management OR M.Sc. (Agri.) With 60% Marks. Max 27 Years. 05. Management Trainee (Human Resource). Candidate Must Have Passed 2 Years PG Degree/ Diploma in Personnel Management/ Industrial Relations/ Labour Welfare/ HR Management. 2 Years MBA in HRM With 60% Marks and Having Knowledge of Computer. Max 27 Years. 02. Management Trainee (Legal). Candidate Must Have Passed Degree in Law With 55% Marks And Having Knowledge of Computer. Max 27 Years. 01. Management Trainee (Quality Control). Candidate Must Have Passed M.Sc in Agriculture With specialization in Agronomy/ Seed Technology/ Plant Breeding & Genetics With 60% Marks. Max 27 Years. 05. Senior Trainee (Agriculture). Candidate Must Have Passed M.Sc.(Agri.) with specilaization in Agronomy/ Seed Tech./ Plant Breeding & Genetics With 55% Marks And Having Knowledge of Computer. Max 27 Years. 49. Senior Trainee (HR). Candidate Must Have Passed MBA (HR)/ 2 Years Post Graduate Degree/Diploma in Industrial Relations/ Personnel Management/ Labour Welfare/ MSW With 55% Marks. Max 27 Years. 05. Senior Trainee (Logistics). Candidate Must Have Passed MBA (Materials Management/ Logistics & Supply Chain Management/ Supply Chain Management) OR B.Sc. (Agri.) with MBA (Agri. Business Management) With 55% Marks. Max 27 Years. 12. Senior Trainee (Quality Control). Candidate Must Have Passed M.Sc.(Agri.) with specialization in Agronomy/ Seed Tech. / Plant Breeding & Genetics With 55% Marks. Max 27 Years. 19. Diploma Trainee (Electrical Engineering). Candidate Must Have Passed 3 Years Diploma in Diploma in Electrical Engineering/ Electrical & Electronics Engineering With 55% Marks. Max 27 Years. 02. Trainee (Agriculture). Candidate Must Have Passed B.Sc in Agriculture With 60% Marks And Having Knowledge of Computer. Max 27 Years. 45. Trainee (Marketing). Candidate Must Have Passed B.Sc in Agriculture With 60% Marks And Having Knowledge of Computer. Max 27 Years. 32. Trainee (Agriculture Stores). Candidate Must Have Passed B.Sc in Agriculture With 60% Marks And Having Knowledge of Computer. Max 27 Years. 16. Trainee (Technician). Candidate Must Have Passed ITI Certificate in Related Trade With 60% Marks. Max 27 Years. 16. Trainee (Stores Engineering). Candidate Must Have Passed Diploma in Agriculture Engineering/ Mechanical Engineering With 60% Marks. Max 27 Years. 05. Trainee (Stenographer). Candidate Must Have Passed Class 12th With 3 Years Diploma in Office Management With 60% Marks And Having Shorthand 100 WPM in English And Computer Typing Test of 35 WPM As Mentioned in Notification. Max 27 Years. 08. Trainee (Quality Control). Candidate Must Have Passed B.Sc in Agriculture With 60% Marks And Having Knowledge of Computer. Max 27 Years. 07. Trainee (Data Entry Operator). Candidate Must Have Passed BCA/ B.Sc in (Computer Science/ IT) OR 3 years Diploma in Engg. in (Computer Application/ Computer Science /IT /Electronics) OR Graduate with 1 year Diploma in Computer Applications With 60% Marks. Max 27 Years. 03. Trainee Mate (Agriculture). Candidate Must Have Passed Class 12th in Agriculture or Equivalent in Science With Biology As one of the Subject Sound Physique. Max 25 Years. 18. 3. Candidates are Required to Register Before Applying for the Post already Registered Candidate does not Need to Register Again. 5. Login With ID and Password and Fill the Application form And Need to Upload All Mandatory Documents. 6. Candidate Can Apply Online On or Before 09th February 2019. Q. What is the Last Date For NSCL Diploma Trainee And Others Post Govt Job Vacancy ? A. 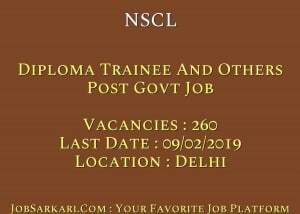 Last Date for NSCL Diploma Trainee And Others Post Govt Job Posts is 09/02/2019. Q. What is the Form Type of NSCL Diploma Trainee And Others Post Govt Job Recruitment ? A. The Form Type for NSCL Diploma Trainee And Others Post Govt Job Posts is Online. Q. How many vacancies are available in National Seeds Corporation Limited Diploma Trainee And Others Post Govt Job Posts ? A. There are about 300 Vacancies in National Seeds Corporation Limited Diploma Trainee And Others Post Govt Job Posts. Q. What is the Full Form of NSCL ? A. Full Form of NSCL is National Seeds Corporation Limited .